guide patients when a dose adjustment or alternative drug should be considered..
Knowing a patient’s genetic profile can help a prescriber adjust patient drug therapy to improve therapeutic outcomes and reduce the risk of adverse drug events (ADE). 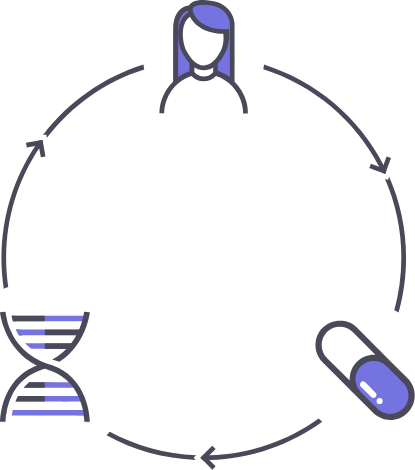 By analyzing an individual’s phenotype, we can see how an individual reacts to drugs, and receive a personalized guidance. Pain-free cheek swab test, quickly and easily conducted in your clinic. Place all the samples into the envelope for shipping. Use our two buccal swabs on each cheek of the patient. We send a detailed report about your patient's DNA. Whether a medication may be an effective treatment for you. What the best dose of a medication is for you. Whether you could have serious side effects from a medication. This is not a comprehensive list. For a full list of drugs covered in our reports, consult your sales representatives.